Do you remember popular simulation games from the late 90s and early 2000s like Rollercoaster Tycoon and Theme Park? 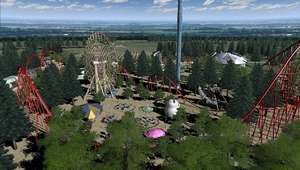 Well as Cities XL has taken over the role of city simulation from Maxis/EA, so has Maximum Rollercoaster as the new rollercoaster and theme park simulation. The amount of things you can build in Maximum Rollercoaster is really staggering. We're looking at a huge list of different types of coasters you can build, food stands, swimming areas, shoppes and many more things you can add to your theme park. Maximum Roller Coaster 1.01 is a shareware program and can be used as a demo to try the software until the free trial period has ended. A full version of the program is available after the trial period ends. For security reasons, you should also check out the Maximum Roller Coaster download at LO4D.com which includes virus and malware tests. Additional screenshots of this application download may be available, too.